We live in the San Francisco Bay Area and love the direct flights to Maui which makes it easy to get to Paradise! We are fortunate enough to be over three to four times a year to make sure our unit stays in tip top shape! Our family has been going to the Maui Eldorado since 1975 and have loved every trip. The Maui Eldorado is situated in the perfect spot close to the sandy beach and also close to Whalers Village for its shops and restaurants. Each trip we try and explore a little more of the Magic of Maui and love having the Maui Eldorado as our home base! Food can be pretty pricey on the Islands and having a condo makes great sense since you can have breakfast on the lanai and then make sandwiches for lunch to eat there or down at the Cabana. There are outdoor BBQ grills to cook up your favorite meats/fish for dinner and nothing beats having a Mai Tai on the balcony and watching the sunset. There are nearby restaurants for dinner if you decide to enjoy a night out! Both bathrooms have large walk in showers and ample towels for your use! Regular landline but expensive charges for use, so please bring your cellphones for use. 3 different AC controls, one in each bedroom and one in the main living room area. Standup washer and dryer, we also provide enough washer detergent. Towels in each bathrooms, please remember that beach towels are available at the private beach cabana. We have pool towels for use at the nearby pools. Wireless Internet in the unit as well as in the lobby and the beach cabana. Please read the WELCOME package for the wireless access code. Fridge and Freezer, Brita water pitcher in the fridge as well. Flat screen HI Def TV in the main living room and 2 other flat screen TVs in the bedrooms. Private Beach Cabana with Shuttle from Lobby, Convenience Store in Resort Lobby includes Coffee Bar and Activity Desk for all your fun on the Island! Loved our stay and location! Beach cabana chairs and towels are great! Walking and swimming everyday in paradise makes me think of our next trip! Thank you to Alan and Family! The condo and complex were spacious and had beautiful views. Great location! Maui Eldorado is a sleeper. 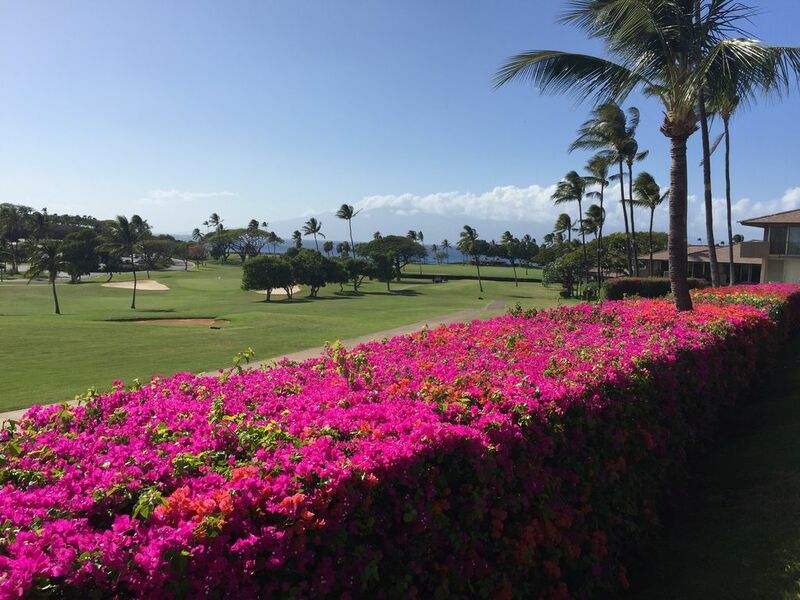 Situated on the Kaanapali Royal Golf Course is fun to watch the golfers hack through the course. Our condo has views of the ocean and we could even spot whales playing off the beach. Located between Lahaina and Kapalua we were able to get to everything easily. Our only regret is that we didn’t have more time to explore the other side of the island. The condo is well appointed and we appreciated having the washer and dryer. The pool areas are great and there are many grills to cook out if you choose. We played shuffle board and enjoyed the pool after spending afternoons at the beach. The one thing I keep forgetting is that we were never crowded. It was almost like our private little secluded beach and pool. Thank you so much for the opportunity to stay in your lovely condo. There was no detail left behind from the helpful information you sent to the wonderful accommodations. We were in Maui for a golf vacation with friends and every evening was spent on the beach by the cabana watching the sunset. We will surely be back! Thank you for everything!!!! Clean, spacious and had everything our family needed! We thoroughly enjoyed our stay at the Brune condo. The location was absolutely perfect. It allowed us to have a place for our four adult children and grandchild to all hang in one place. Mays Beach is a hidden gem. The beach toys were a great surprise. The cabanas made us all feel like VIPS. Although it's a bit of a walk to the beach and to Whaler's Village we were grateful for the exercise after indulging at Monkey Pod and Leilani's. When our grandson was too pooped to walk the golf cart took us right to our door. The bedrooms are enormous and the beds are super comfy. Downside: (only a couple of things) the lawnmowers start EARLY, 5:30-6 a.m. and the air conditioning is quite loud in the bedrooms so when you close the doors to avoid the sound of the lawnmower it's replaced by the air conditioner. The pool closest to the condo was under repair for our entire stay BUT the big pool was awesome and accommodated our very large group for a family BBQ. We will re-book, that's for sure!!! We had an amazing first time in Maui, staying at Alans place. Great location with shopping and lots of eating places close by. Rooms were great and enough space for our family of 5 and parents. The Lanai was huge and let so much light into the condo. Both bathrooms had very large showers and provided enough room for us to move around in. Lots of spices and seasoning to use in the kitchen. We didn't have to buy anything besides the food we wanted to cook. I would say, we did have to reset the breaker a few times which was stated in the welcome package. It was just a walk down the stairs to the box and power was restored. It only happened when we cooked rice and used the microwave at the same time. There were plenty of beach equipment available for us to use. Body boards and snorkeling gear definitely saved us time any money from buying or renting our own. Alan was very responsive with questions I had during our stay. We would definitely stay here again if we come back to Maui. The condo exceeded our expectations in every way. Everything was very updated including the kitchen and both of the bathrooms. The lanai was extremely large with lots of space for our family of five to relax and to eat. Being able to not only watch the golfers but also enjoy the ocean views and sunsets made it one of our favorite spots morning and evening. It is very close to the busy part of Kaanapali by the hotels which is fun and full of restaurants and shopping and lots of people as well as the quiet part of the beach right by the condo. Having the cabana down at the beach to pick up chairs and beach towels was wonderful. Whaler's Village provides the perfect spot to eat dinner out but we truly enjoyed staying in and using the nice built-in grills by the pool and then eating on the lanai. Just across the street from The Eldorado is a small grocery that has food and liquor and a great bakery. The owner was a dream to work with. He was responsive and provided many suggestions. We would love to return. For more photos email the owner directly through the VRBO site!